I have oily-combination and sensitive skin type, and keeping it reasonably clear and acne-free is a constant battle. Over time, I have found a few brands/products that suit my skin and keep the the oilness in check without irritating or overdrying my skin. I do experiment every once in while, but for the most part my routine remains the same - cleansing, occasional toning, and moisturizing. Here's what the cleansing/deep cleaning part of my skincare routine looks like now. For the mornings, I don't need much of a cleaning so I use any creamy, foaming cleanser I can find, as long as it doesn't cause any breakouts. Right now, I am using a brightening face wash from Chanel's Le Blanc range (got a lot of samplers with purchase). I need only the teeniest bit of product, and it leaves my face squeaky clean. While I haven't noticed much in terms of skin lightening, products that have the "whitening" tag generally tend to dry out my skin, and I find this ideal for the summers. I don't use a toner on an everyday basis, but I do try to add in the step whenever I remember to (obviously, I have those blemishes for a reason :P). Am currently trying out Chanel's Lotion Doceur - another one of the samplers I have to finish off! It's gentle and adds back a little moisture into my skin without making it oily. Used after the slightly drying Le Blanc face wash, this balances my skin perfectly. For the evenings or if I have been out, I opt for products that pack a little more cleaning power. Olay Daily Facials Cleansing Cloths are like disposable washcloths with the cleanser already added in them. Moisten, work up a lather, and use. I use warm water to wipe off the cleanser, and the textured cloth gives a bit of exfoliation and deep cleans the pores while the cleanser removes any grime and makeup. Among all the cleansers I have tried so far, these cleansing cloths from Olay have been my favorite! Am also currently trying out the Neutrogena Deep Clean Daily scrub - a creamy gentle scrub that can be used every day. Both these products have salicylic acid in them - the Neutrogena scrub has 2% - so they both are great for oily, acne-free skin. And finally, deep cleaning: A good clay-based face mask is my must-have product to deep clean and sort out my skin. I have been using Lush fresh face masks for a while now, and my current favorite is Lush's Brazened Honey. It has turmeric, honey, and clay that work great at cleaning up oily skin and fighting blemishes. It also has almonds for some gentle exfoliation. 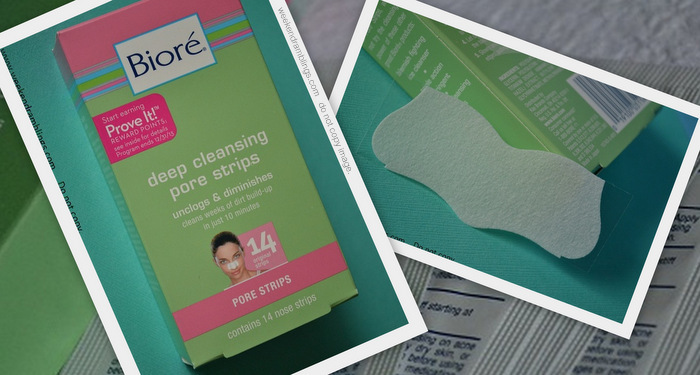 I almost forgot to add the Biore Deep Cleansing Pore Strips - which explains the collaged photo added in - I use these about once or twice a month to get rid of any pesky blackheads that tend to show up on my nose. So that was my basic skincare-cleansing routine. What are your go-to products for a clean face? Thank you, Shruthi :) So what's your go-to face cleanser?